My Kitchen is a Mess | Separated by a common language. But Steve cleaned it for me! Hooray for helpful men! He was very nice and took care of me all weekend! Now I’m watching some weird movie starring Marisa Tomei and Robert Downey Jr. Only You! They both seem to have the same haircut, which is really weirding me out. I tried to find a movie poster, but they’re all huge, and really, do I want to look at a man and a woman with the same haircut, ESPECIALLY, RDJ? No way! 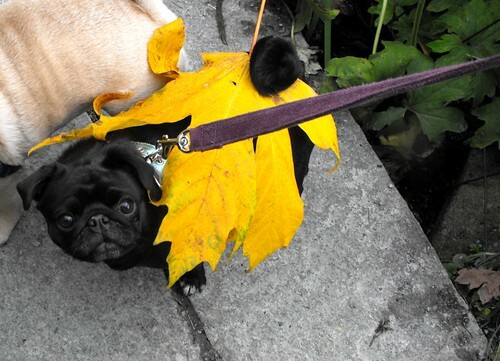 Is that a real leaf?? It’s freaking huge! Either Zelda is really small or the leaf is really big! Holy cow that’s a big leaf. I’m sorry you’re sick again!! Oh my ! Zelda is so friggen cute! Indeed, the leaf is real. I almost pooped my pants the first Autumn we lived in Vancouver because some of the trees are basically dropping whole sheets of paper onto the ground!